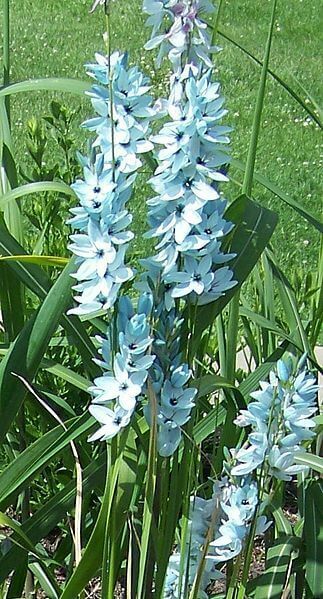 Also known as Turquoise Ixia, is a tall member of the genus Ixia. It comes from around the Tulbagh in South Africa, Cape Province. It has small corms under the ground. This corn lily is a very rare plant. Its habitats are often destroyed by human influence so the conservation status of this interesting flower is vulnerable and is tending to worse. 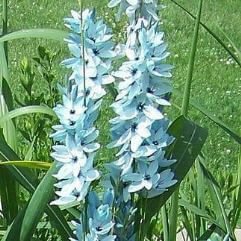 The plant gets the name Turquoise Ixia from the really spectacular turquoise colour of the flowers. They are grouped in long inflorescences and are traditionally star-shaped like in most corn lilies. They have a black centre with purple spice. The Turquoise Ixia has very good ornamental traits with its beautiful inflorescences but is very rare in cultivation. * Sold as 1 X Bulb during summer to early autumn and as a plant during the rest of the year.